Have you ever heard of spatial hearing loss? It’s a form of deafness where the person affected can’t discern the direction a sound came from. If you dropped a book in a classroom, the person with spatial hearing loss wouldn’t be able to tell if you dropped it from the back of the room, the doorway, or the teacher’s desk. Basically, it’s like playing a match of PlayerUnknown’s Battlegrounds (PUBG). 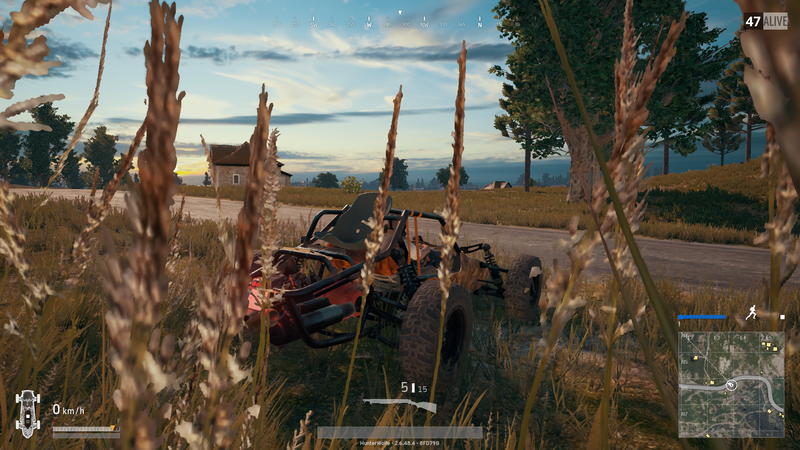 I just joined the nearly three million-strong army of Battlegrounds players last week, and while I recognized I was playing an early access title, the game’s lack of a shot direction reticle surprised me — a typical shooter mechanic that indicates where enemy bullets are coming from, allowing players to get out of dodge. The more I think about this design decision, the more nonsensical it becomes to me. Playing Battlegrounds with editor Mike Pearce feels exactly like being co-stars in a buddy cop movie. He didn’t retreat. He didn’t take cover in the nearby trees. He crouched. In a game where killing an enemy typically elicits a massive dopamine burst, his action evoked something surprising from me: pity. The poor bloke didn’t know where the shotgun blast had come from. I enjoyed looting the player afterward, but I couldn’t help but sympathize with his assumed frustration as I stocked up on his collection of Red Bull cans. After my first shot, he’d had no clue where the bullets came from. I could have been hiding a few yards behind him, sniping him from a mile in front of him or blasting him from a bush right next to him, and he’d be none the wiser. A bullet detection reticle doesn’t break a game. It’s a necessary mechanic that provides critical feedback to players and makes games more fun. PUBG purists on Reddit argue that a bullet detection reticle would compromise its unforgiving survival gameplay, but in a title that plays more like a stealth game than a shooter, there’s a greater need for sensory input mechanics, whether or not those mechanics feel like a crutch. PUBG tries to simulate a survival scenario that requires players to be extra perceptive, just as they would be in real life. But in real life, a person would be able to tell the direction their enemies were shooting from. Not only, then, is the lack of a bullet detection reticle purely frustrating for players, but it also contradicts PUBG’s goal to simulate a life-or-death battle royale. Players feel the inclusion of a bullet direction indicator would penalize smart (or lucky) players who get the drop on their enemies, but in Fortnite, developer Epic Games’ contribution to the battle royale genre — which does include the reticle — this isn’t the case. Being ambushed by an enemy is an equally frantic experience in both games. Players fall into panic as the sound of bullet spray jolts them into high-alert, running for (or creating) nearby cover. And being the player that sneaks up on their enemy is equally rewarding in both titles, as well. The only difference is that in Fortnite, the indicator gives players a reasonable, but not excessive, suggestion to their enemy’s location — and a greater chance (but also not excessive) chance of fighting back. The lack of a bullet detection reticle creates a barrier to entry for players like me who don’t play many shooters. Including a bullet direction indicator would also combat the sense of disappointment that rises out of taking a blow from God Knows Where. A common complaint (but defining characteristic) of the battle royale genre is the jarring chagrin of losing all of your progression from each match. Especially when you don’t know where the bullet came from. Including an indicator would grant players critical feedback that not only informs them of their missteps but affords players the knowledge to improve their game. Would learning how to play better compensate for losing all your progression every twenty minutes? I think so. PUBG only just came out of Early Access to an official launch last month, but developer Bluehole has been retooling the game long enough that the absence of a bullet reticle is questionable. Fortnite has the right of it though, so maybe I’m not hungry for a chicken dinner today.